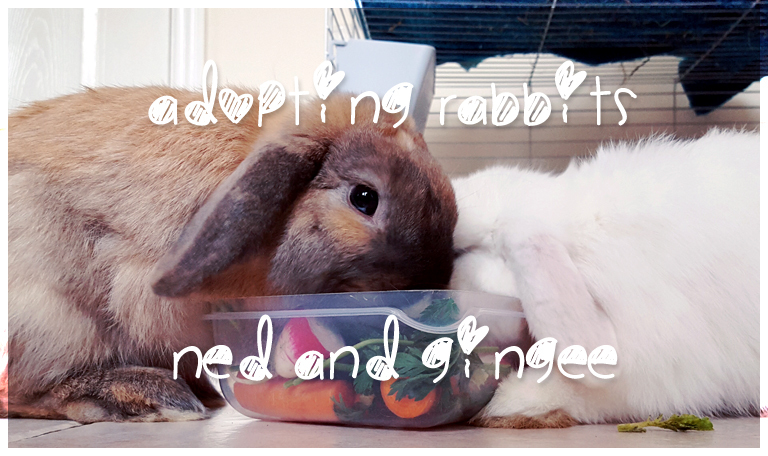 I’ve written about how we came to adopt Ned and Gingee, our first two bunnies, before. 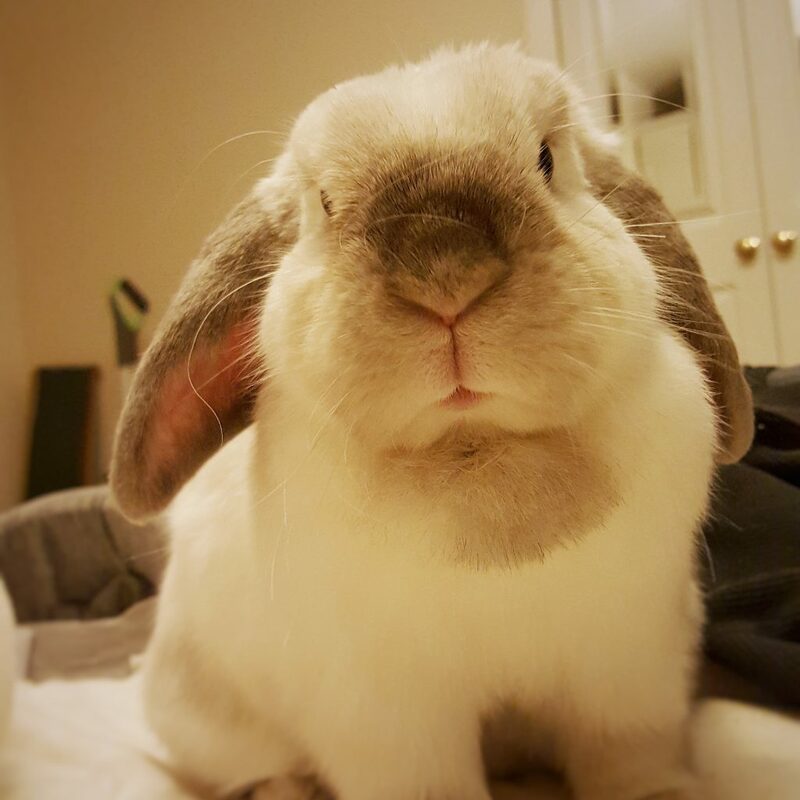 And Barbara, our rescue rabbit, has her own regular section on this blog! But I’ve never really talked about how she came to live with us, and her story. The first thing about Barbara is that we don’t know too much about her history. 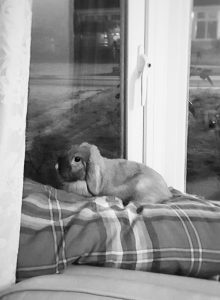 We know that she is the softest of all three of our rabbits, that she loves apples more than anything, that after she’s had her claws clipped she needs to nibble your nails in return… but we don’t know how old she is. It’s strange to have a family member that we love so much and yet so know so little about her. We first met Barbara in November 2016. Ned and Gingee had lived with us for over a year by that point. 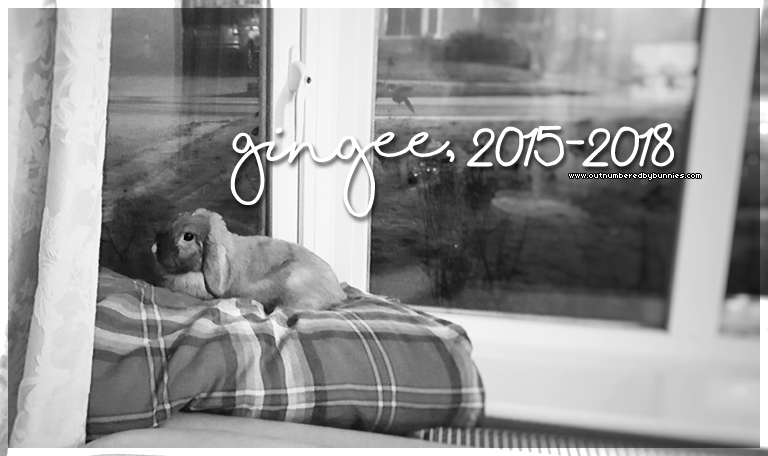 They fought all the time so lived separately – Ned upstairs and Gingee downstairs. We’d pretty much given up hope of bonding them. I have been in this store since March so the charity is trying to find me a loving home. She was this massive (compared to the boys), grumpy, sleepy floof. Easily noticeable. But I absolutely did not want a third rabbit. We had Ned and Gingee and they needed a room each and were clearly never going to bond. We were at our limit. So I kept on seeing her, hoping someone would adopt her, and going home again. I wanted her to have a home, but I didn’t really see that it needed to be our home. So that evening, we sat down to talk about Barbara. What would we need to know? What should we take into consideration before making the decision whether to adopt her or not? 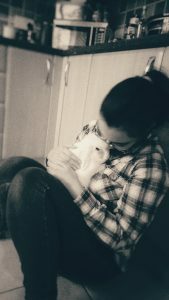 Could she live with other rabbits? Was she likely to bond with anyone else? What was her health like? We already had one special needs bunny in Ned – in one way, that meant we knew what to do and support a frail rescue rabbit, but in another, it meant that we were already stretched fairly thin. Why had she been there so long? Why did no one want this poor girl? 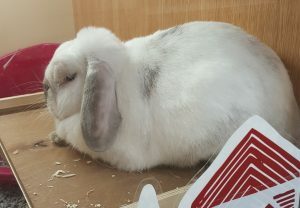 Nearly nine months is a long time for a beautiful bunny to wait for a new home. We decided that I’d go into the shop tomorrow and ask the questions. Find out a bit more about her, and then we’d make a decision. I don’t know that I’ve ever been so nervous as when I went in to talk to someone about her. Some time in the last few days, my feelings about her had completely changed and I was suddenly petrified that she’d have been adopted. “That’s okay,” I tried to reassure myself. “I just want her to have a home. It doesn’t have to be with us.” I was lying to myself. Suddenly I wanted to get to know this big fluffy bunny much better. I needn’t have worried. She was still there. Still big and fluffy and grumpy. And the staff were thrilled that we were asking about her. They wanted her to have other rabbits for company. So far, she hadn’t got on well with any, but they thought that she’d do well with a boy who might be a bit compliant as she seemed rather bossy. (Maybe Ned, I suggested.) They’d tried to bond her with a few, but no luck. They thought she was about three years old, maybe a bit more. She was fairly healthy by then. However, when she’d come to them, she’d been neglected and abandoned. Her claws were long. She walked on her heels so had sore hocks. She was so thin you could see all her ribs. She’d never gone to the vet. Her teeth were bad and she had to have them filed down. She hadn’t been spayed so had cysts. She was in pain and was very aggressive. Her tear ducts leaked (like Ned!). The charity had paid for her vet treatment and she was now the picture of health. She hadn’t been eligible for adoption the whole time as she’d been so sick. 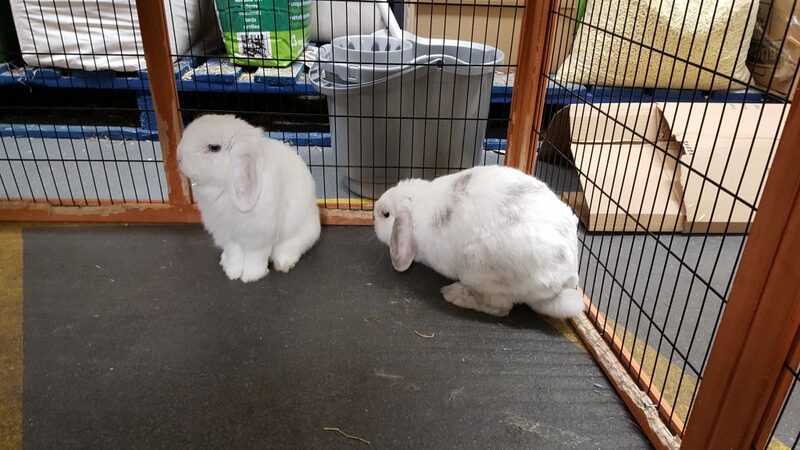 Now that she was, they wanted to make sure she went to a home where her new humans knew about caring for special rabbits. Well, it wasn’t quite what we’d expected, but we certainly knew we could care for her. We were already taking care of Ned’s bad eyes, and wiping a few more bunny eyes would be easy enough. My heart was breaking for this poor girl who had had such a rough time, when our boys had everything they wanted. How could we not pursue this further? They suggested bringing Ned and Gingee in for a date to see if everyone got on. 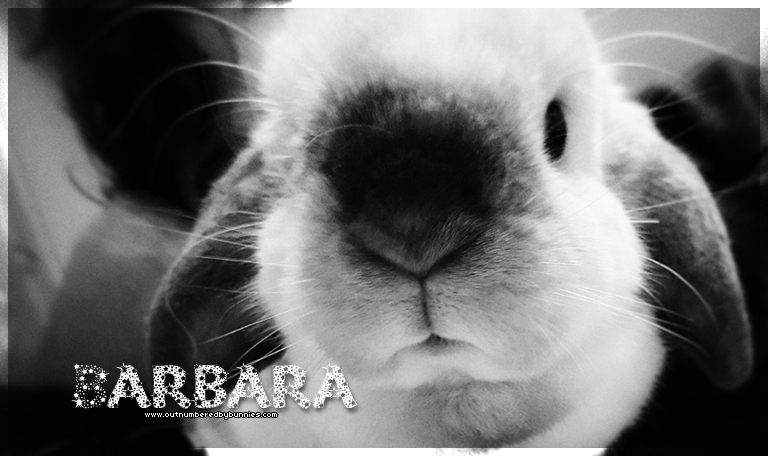 So, that weekend, the boys hopped into their cases and we drove over to properly meet Barbara for the first time! I won’t say it was all plain sailing. We didn’t all bond instantly. It took until April before all three rabbits were living happily together in one room, and Barbara came home on 12th December. We’ve had some health problems, too. At her first vet visit, they noticed her teeth needed filing again, and we learnt that she’s not good with anaesthetic. She takes a very long time to wake up. She developed some arthritis in her elbow. With medication, all of the problems related to this have cleared up, but we worried for a while that she might need one leg amputating. We think she may actually be older than three. Eight? Maybe younger? Her bone density is very low, which is either a sign of being an old lady or due to malnutrition in earlier life. 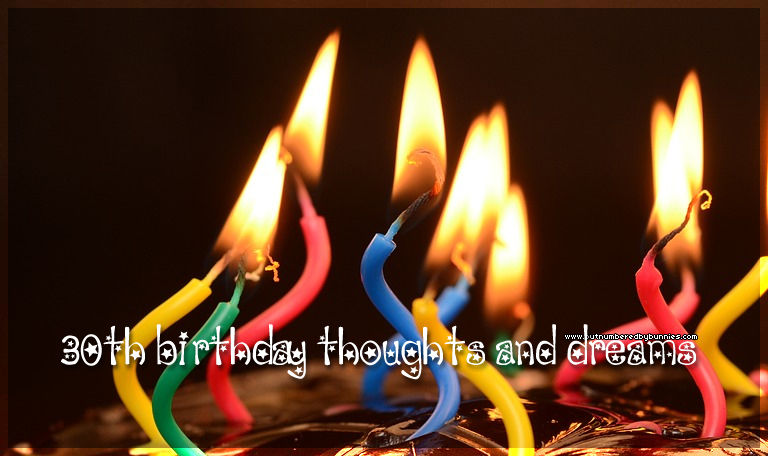 We hope she’s younger than eight as we want to have a long time with her! Now that she enjoys life, we want her to have a long one. 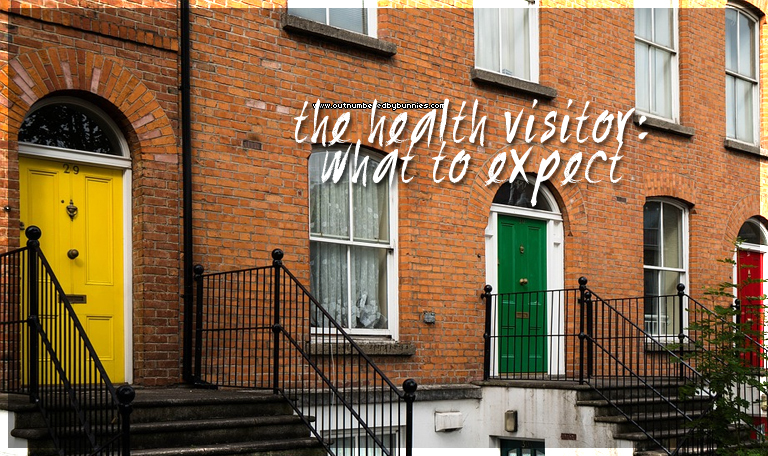 Barbara moved in with us on the day that a dear friend of mine passed away, and I had a difficult time adjusting. She loved my husband from the start, I think, but she and I didn’t bond immediately. After how easy it had been for me to bond with the boys, I felt awful. She was so skittish and not as playful as the boys, and it was a strange transition for us all. And the more confident she got, the more she and I bonded. I can honestly say that we’re very close now. She’s one of my favourite people in the world! How can I help it? She’s grumpy, demanding, so intelligent, very sassy, and knows what she wants. She’s just fabulous! Look at my beautiful girl. That confident face! She has come such a long way.